Pastels are a relatively inexpensive and versatile alternative to paint. Pastels are comprised of the same pigment that makes up paint but bound into a solidified stick, instead of being bound into a fluid form as with paint. When the stick is pressed and run along the surface of a sheet of paper, the friction causes traces of the pigment to be deposited on the surface of that paper. Pastel as a medium must be carefully protected (like charcoal) in order to stop the surface fading as pigment dust is worked free from the paper over time. Pastels drawn on rough paper will be least liable to fade in this way. If in any doubt then use a fixative spray to ensure that your drawing stays on its surface. Be sure to do this in a well ventilated room as solvent fixative sprays can be harmful. Artists such as Chardin (1699-1779) and Degas (1834-1917) have been as famed for their pastel drawings as for their paintings, putting paid to the myth that pastel is a medium for amateur artists. Pastel is a very physically involving medium, often entailing the smudging of colours on the surface of the paper with the artist’s hands. The ability to do this makes pastel a very versatile medium that can be returned to and changed again and again prior to completion. Pastel Pencils: Pastel pencils are held in a wooden casing, as with lead pencils. These are good for final details and for design work where colour is needed. 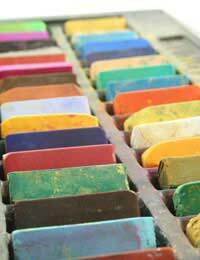 Oil Pastels: Oil Pastels are bound by oil and wax, giving them a consistency not unlike semi dry oil paint. Oil pastels are very different from dry pastels and leave a residue that cannot be moved from the surface of the picture with time. Oil pastels will not mix with dry pastels. The final effect that oil pastels leave is not unlike that left by unthinned oil paint. The main difference between oil pastels and oil paint is that oil pastels are not so easily blended, although this can be achieved on the papers surface by smudging the oil with your hands. Water Soluble Pastels: Water soluble pastels are basically soft pastels that can be manipulated on the surface of the drawing with water. This medium can be used in a similar way to watercolour, or can be applied and left dry, making it very versatile. What type of pastel you use will depend on the effect that you wish to create within your work. Many artists use all available types alternately or, where appropriate, together.